It has been 4 years since I have started planning GIZMON iCA. At that time, I was absorbed in designing cameras. Because I had been selling conversion lenses for iPhones until then, I knew about the iPhones’ surge of popularity among the photograph industry. Then I started to think like this; Are my cameras really superior to those of iPhones? What would happen to the photograph industry if nothing changes? iPhones provide high performance camera functions, and you can take amazing pictures by using many applications. In addition, you can easily share your pictures with many people if you use e-mails and other social networks. However, I started to feel that the fault of iPhones when taking a picture is its’ shape. If only iPhones were shaped like real cameras… I thought. I think this goes along with many major manufacturers’ ideas as they are launching classical designed cameras currently. GIZMON iCA was designed from my thoughts of wanting to make an iPhone into a real camera. 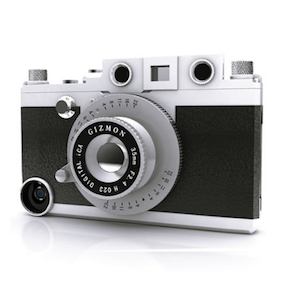 I have designed the GIZMON iCA as an authentic camera. It’s just like using your iPhone as a digital camera back. Since it’s made from about 40 components, it takes impossibly long time to manufacture compared to the other iPhone cases. Otherwise, it couldn’t be made into a complete camera. This strong preferences toward making GIZMON iCA lead to receiving a high evaluation from many users. I am truly glad about GIZMON iCA being nominated as one of the wonderful works at German Design Award 2014. I will strive to do my best with designing more fun and unique products so please look forward it.